Doctors use the medication isotretinoin or Accutane to treat severe acne or psoriasis. According to the PDRHealth, an online version of the "Physician's Desk Reference," Accutane should only be used in patients who have not had any success with any other acne medications. This medication can cause birth defects, miscarriages, premature births, depression or other mental health problems. Accutane can affect other parts of the body as well--including the eyes. In some patients, Accutane can cause dry eye symptoms. For many, using artificial tears can improve the symptoms. However, if the discomfort, pain and foreign-body sensation does not improve with over-the-counter artificial tears and ointments, the patient should contact the prescribing physician, according to the New Zealand Dermatological Society. 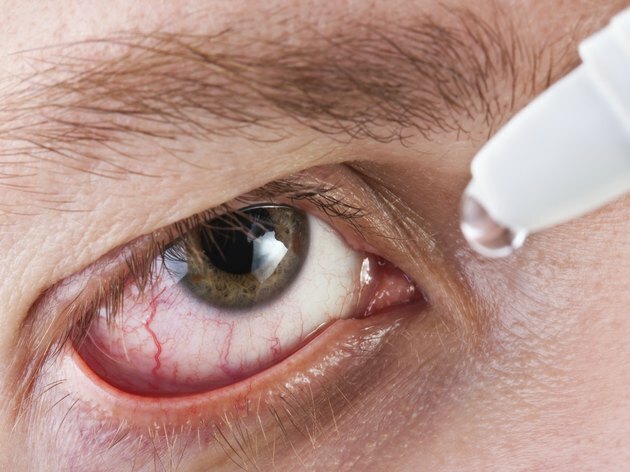 Patients may not be able to wear contact lenses while taking this medication. There have been cases of decreased night vision in patients who are taking Accutane. According to the Skin Therapy Letter website, this side effect is usually temporary but rarely can be permanent. Because the onset of the decreased night vision is typically sudden, patients should be warned of this potential side effect beforehand as noted on the Accutane product label. Blepharoconjunctivitis is a possible side effect of Accutane. According to a 2004 article in the "Review of Ophthalmology" journal by Dr. Mark B. Abelson, Kevin Cohane and Kate Fink, the drying properties of this medication can lead to ocular surface problems like blepharoconjunctivitis, which is an inflammation of eyelids and conjunctiva. According to the product label, some patients who take Accutane can develop opacities in the cornea; when the medication was used in higher doses, the incidence of these opacities has increased. Typically, these deposits in the cornea resolve after the discontinuation of the drug. Changes in color vision are also another possible side effect of the medication Accutane, according to the Indiana University School of Optometry. These changes are usually reversible as well. Accutane has been associated with a few cases of pseudotumor cerebri, or benign intracranial hypertension, according to the product labeling. Increased pressure around the brain causes papilledema, inducing swelling of the optic nerve head that can be seen during an eye examination. If this side effect is found, the patient should discontinue the Accutane at once and be seen by a neurologist. What Are the Dangers of Using Retin-A?